I have a problem in my home, I have a lot of scrap wood leftover from projects. Instead of getting rid of the wood like a normal person wood, I keep it, all of it! I also have a problem because I like taking too many pictures of my kids and keeping their art work around the house. 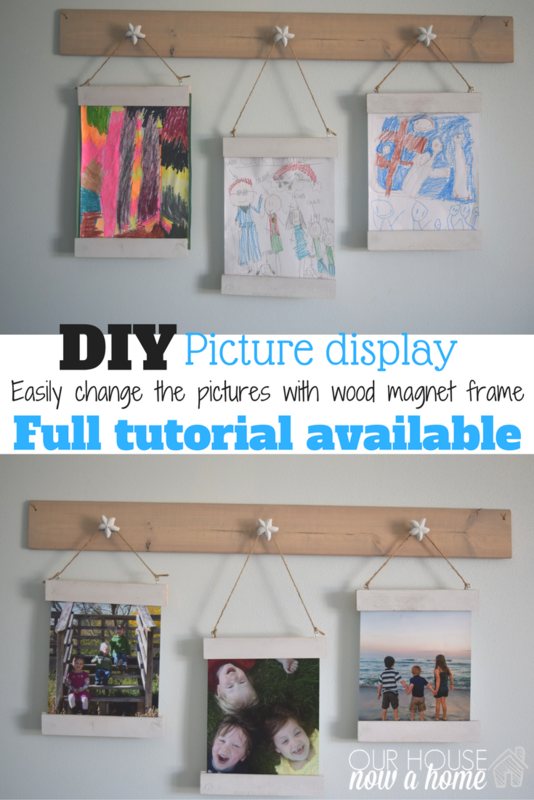 This is why the Easy to change wall art display with magnet frame is just what my home needs! 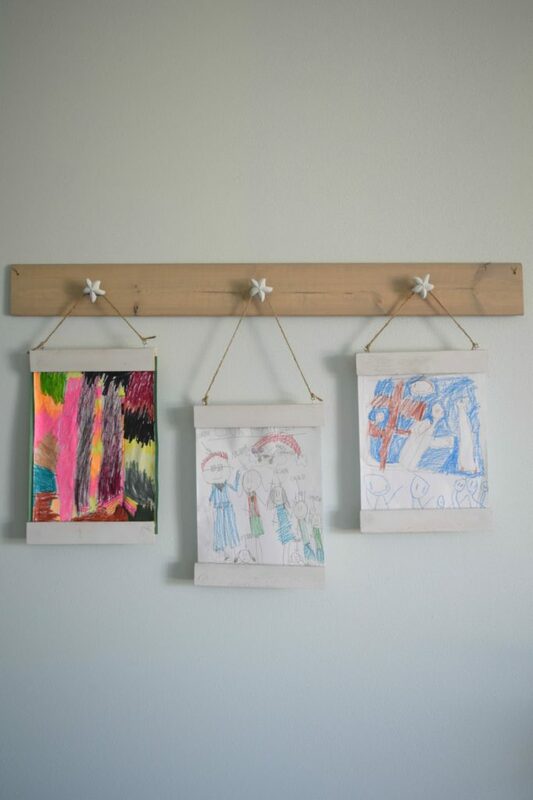 This is a DIY project using scrap wood, and can help me display the pictures of my kids or their wonderful artwork! 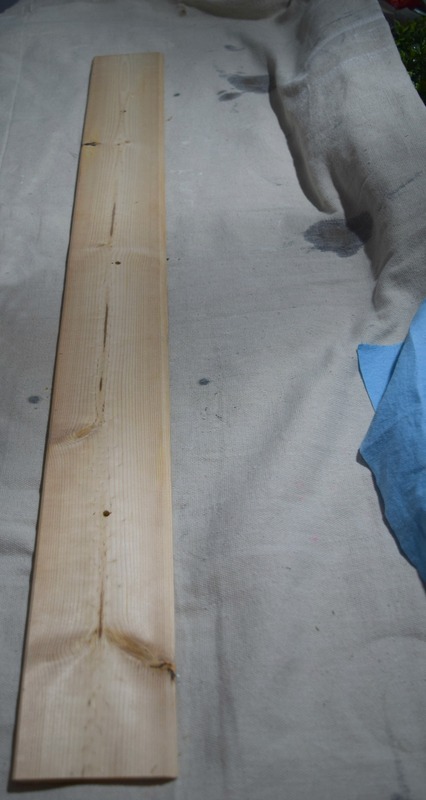 It has been a while since I got crafty, and even longer since I used my mitre saw. I broke that trend this past weekend when I had the saw dust flying for a simple and easy craft project. 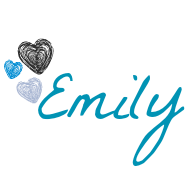 Because I am a Mom and adore my kids, I think they are the cutest things to ever exist and also like taking pictures of them…. it means I like to display their cute faces all over my home. Also, because I am a Mom and my kids make a lot of art work, I created a Easy to change wall art display with magnet frame to show off pictures of my kids and to have the option to display their art work. Yep, this project is a two-for-one. 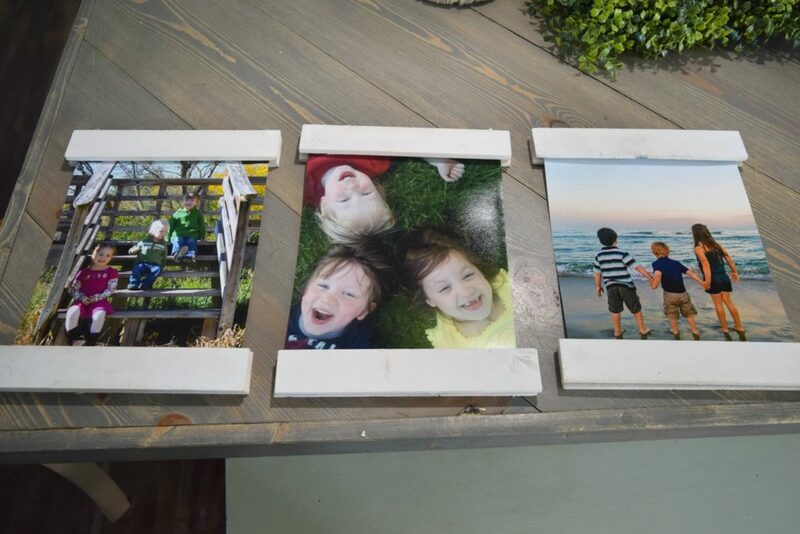 I made these wood scrap frames to be easily changeable. I can update the pictures or show off my kids artwork, more on the details of that in the post. 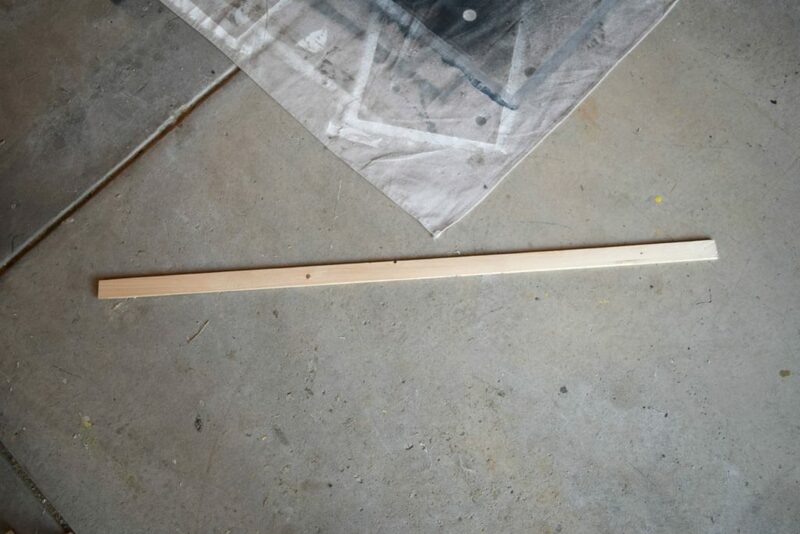 It all started with this scrap piece of wood. It is about 1 inch wide and a super tiny thickness. 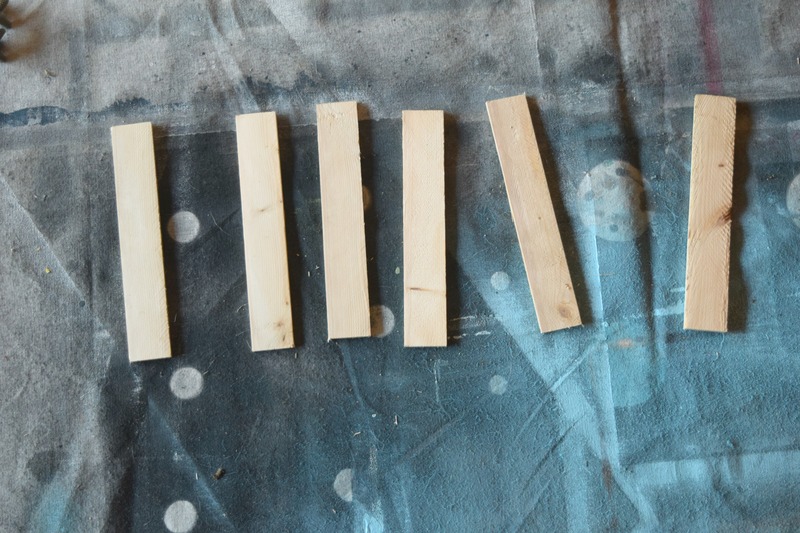 I purchased a bundle of these wood pieces, all with slightly different thickness and size. I believe they are pine wood pieces, but I could be wrong on that too. 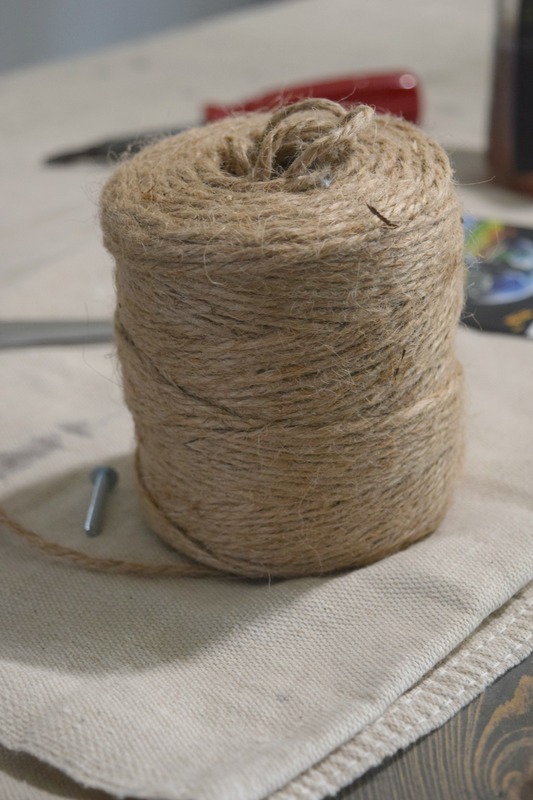 I got the bundle for $2 and keep them in my garage for crafty times like this. This wood piece will be the frame to the pictures. I know picture frames, I would like to think that my hobby is DIY, but in all actuality it is more like DIY wall art. I have made so many wall decor items for my home and here I am eagerly making another one! I purchased new three drawer knobs. I wanted to go really simple with wall art display with magnet frame, keeping clean lines and colors. A pop of fun with the starfish, keeping close to my coastal roots. 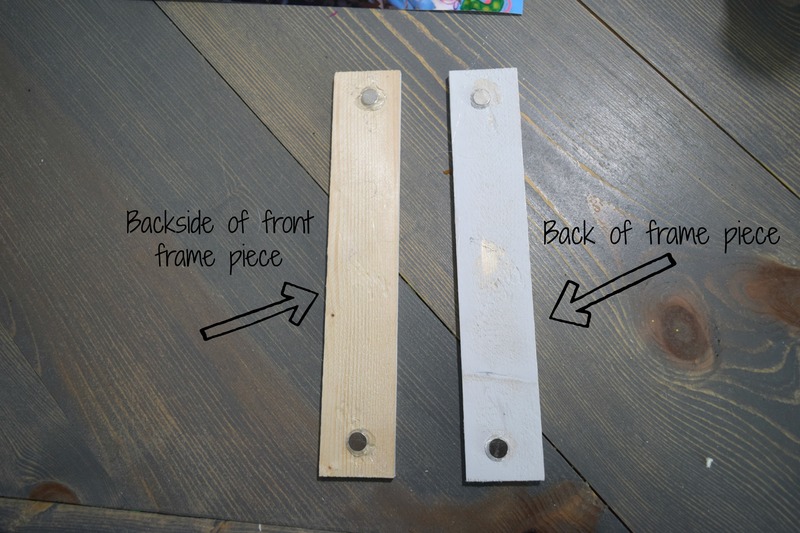 I plan to use this DIY picture display all year long, so the colors are going to be mainly white with a light stain to the wood. This way anything displayed in this (since they are changeable) can “go” with it regardless of season. I spray painted these little drawer knobs white. Keeping my options for the use of this is also why I chose to make three frames. I can either put three pictures, or one picture of each of my kids, or one art piece from them. I am taking full advantage of the easily changeable option with these! This wall art display turned out so well as wall filled with these would look really nice. Since these are done DIY style they are completely customized! If you need a longer one, or need more picture options it can easily be done to exactly what you need. I cut a few options for the frame down to size to see what I liked. I ended up with a little under half an inch leftover with the frame. I liked these proportions. The pictures I chose I had printed at Wal-Mart and are 8×10 sized. 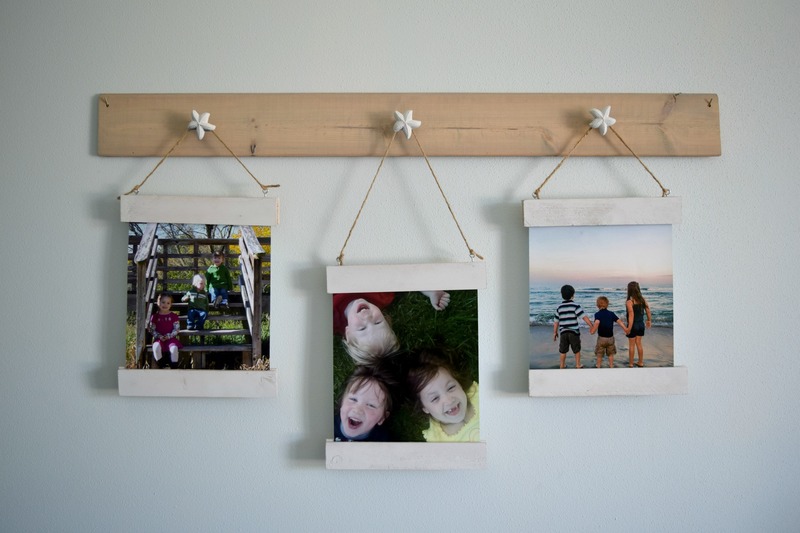 Nothing fancy needed to get these special moments printed and on the walls. I cut the pieces down to size, this is exactly half of what I need. I will be placing two wood pieces at the top and two at the bottom of each picture. Placing one piece behind and one in front, as a frame to this. Leaving the sides loose. 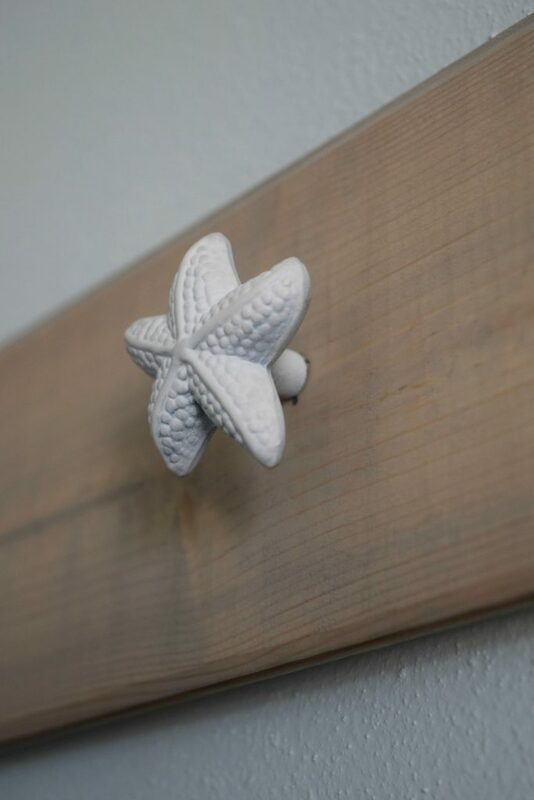 I spray painted them the same white as the starfish knobs. 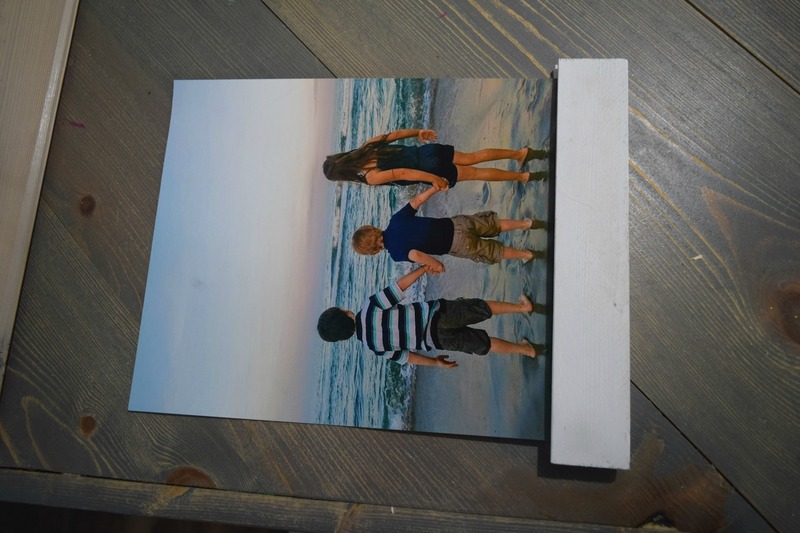 I do not have a picture of the wood board I am using as the base of this picture display. This board piece is what the knobs will be screwed into. I had kids running in and out of the garage, dogs trying to make a run for it, questions of “Mommy what are you doing?”…. pretty much anyone with kids understand exactly what I am talking about. 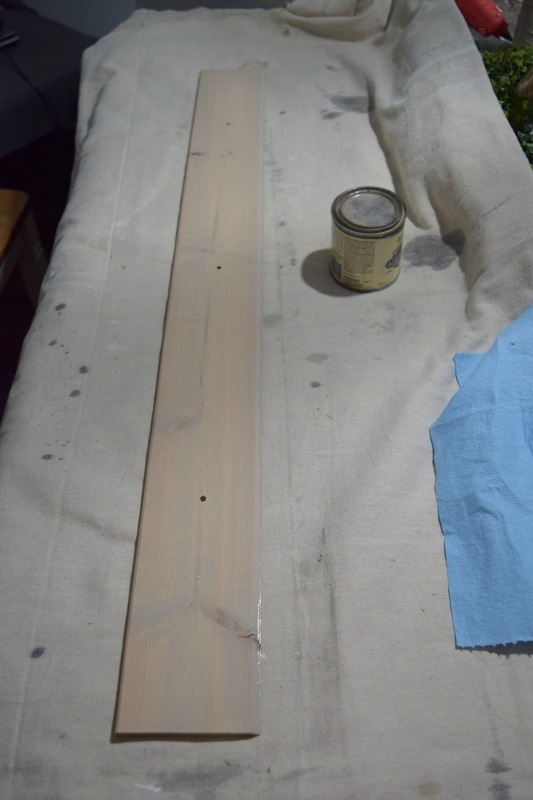 So I did not get a good picture of the board before it was all cut up. I am sorry for that. 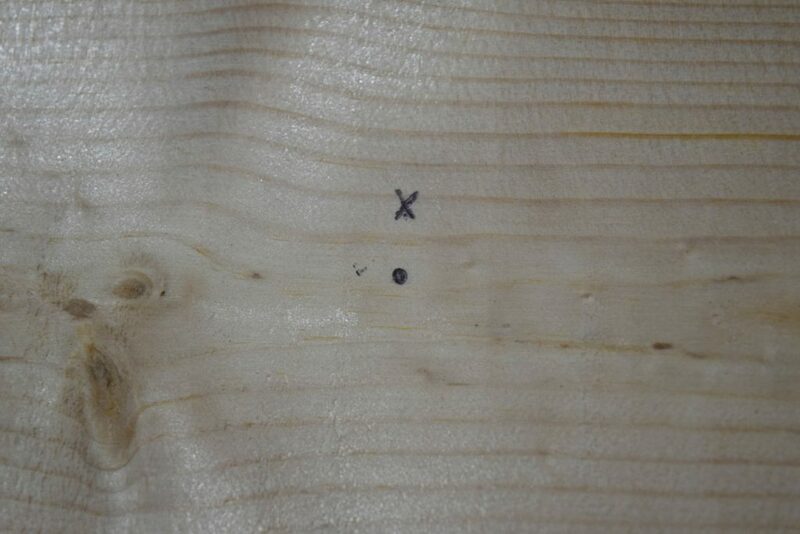 Once it was cut though I measured and marked, X marks the spot for the three holes to be drilled in. These will be in the center and one on either side to have the knobs screw into. Here is the cut board with holes drilled into it. The board appears to be a trim piece of some kind because it has a slight angled top, but I cannot remember what I used this board for. Hopefully I did not purchase it for a future project, and I just screwed it all up by using this board. It must not be too important if I forgot about it. 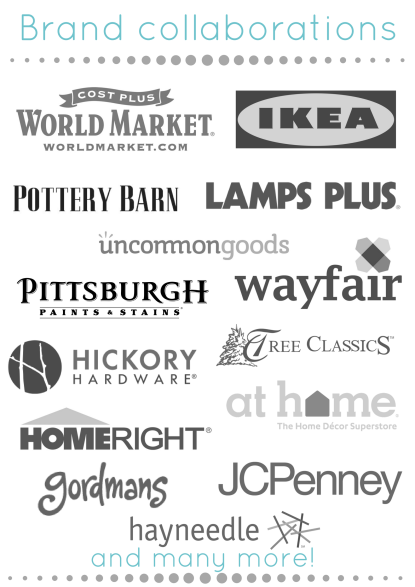 I am using a sun bleached wood stain. 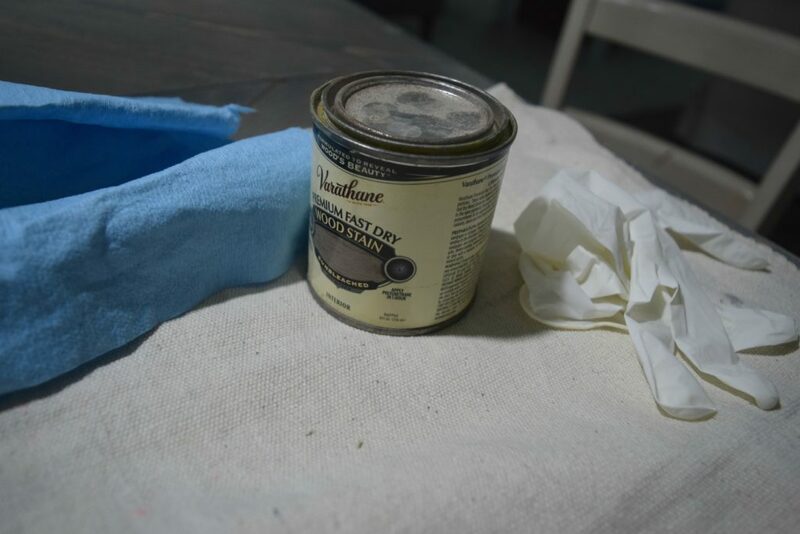 This stain is one I have loved but the lightness of the stain has never found a project to use it on. 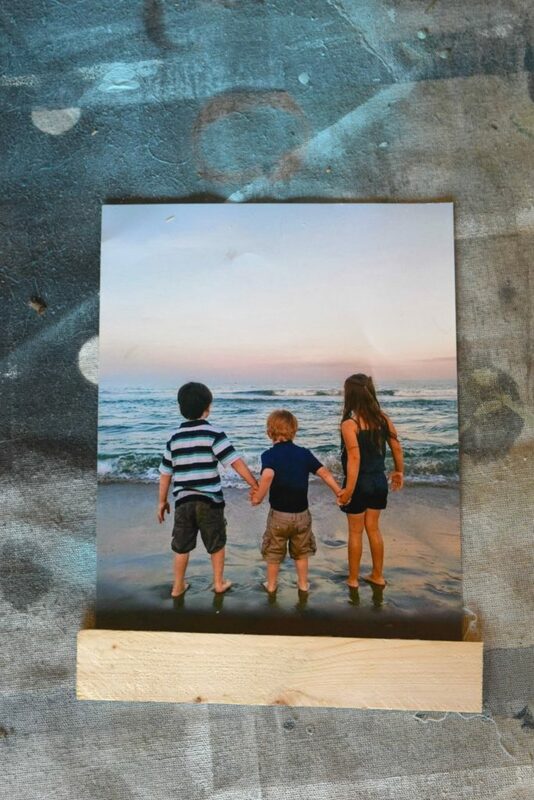 The wall art display with magnet frame is the perfect storm and just what a subtle wood stain needs. The pictures I picked to put in these frames have enough color, and any artwork I may put in them will be plenty colorful as well. So this is needing a clean and simple color scheme on the wood to not be overwhelming. I put two coats of the wood stain on. Believe it or not, but the above picture has the two coats of wood stain. I warned you it was subtle. Next is time to finish the frame portion of this project. I screwed in by hand these little hooks to the top and back of the wood frame pieces, two on each end. These magnets are heavy duty ones, and are the key to making this the easily changeable awesomeness that it is! Using a hot glue gun and gluing the tiny magnets to the back of the frame. The magnets are super small, so to insure I had them line up properly I actually glued on the two magnets on the back piece of board. 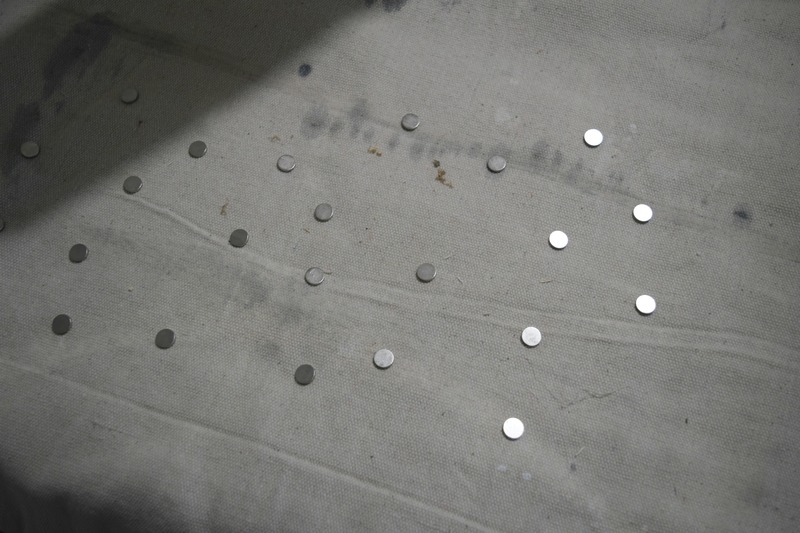 Then set the magnet match on top of the magnet, letting them do what magnets do best. 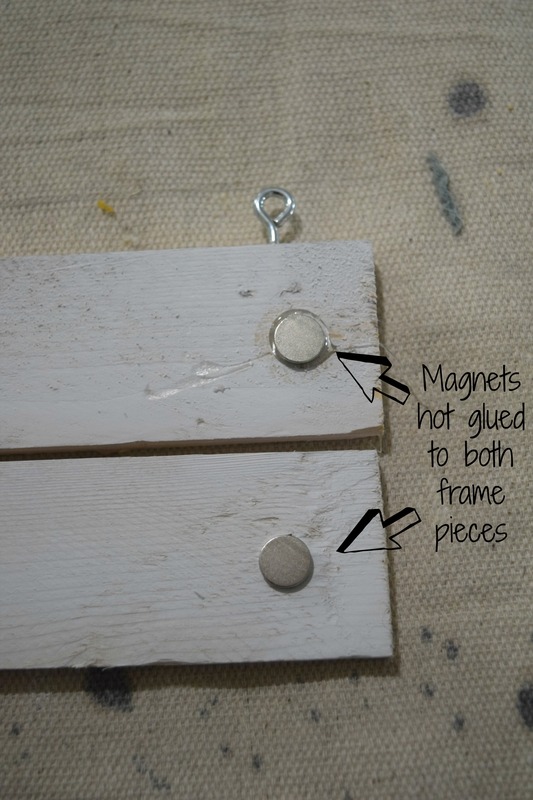 With them on top of each other perfectly I then put some glue on the top magnet then pushed the front of the wood frame onto it. Once the glue had dried I was able to separate the magnets and I had fully aligned magnets. The frame pieces are ready for their pictures! 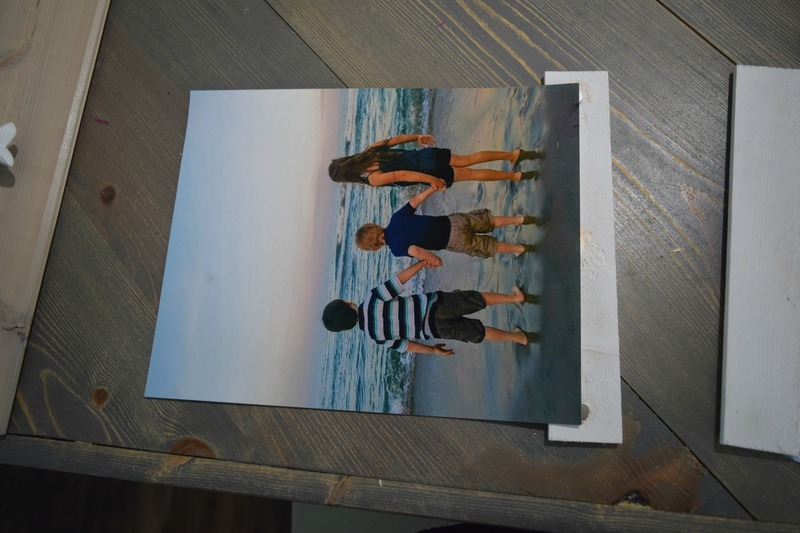 The whole point of this project and the challenge is the family pictures. I chose some fun and colorful pictures, one recent and two that were taken a few years ago. Once the wood board stain was dry I was able to screw the starfish into place. Notice the child on the side of the picture above? I roll three kids deep wherever I go, especially if I am doing something fun, crafty, decorating or even remotely interesting. 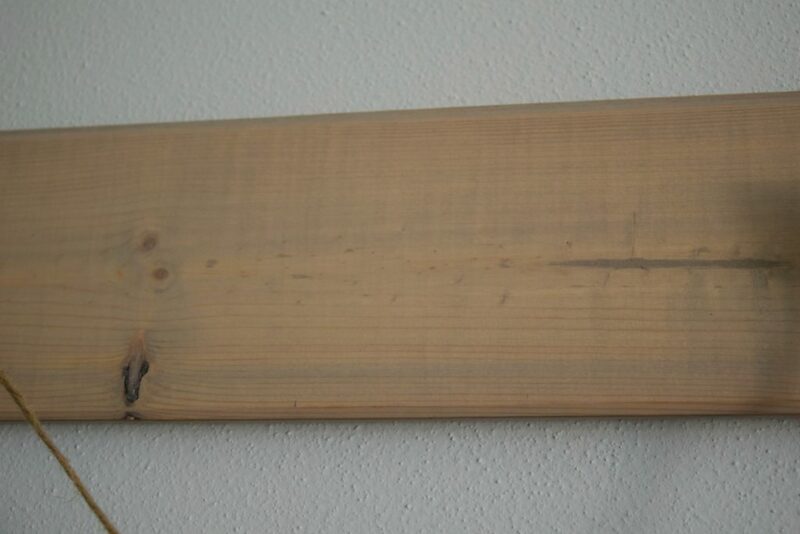 I hung the board on the wall. 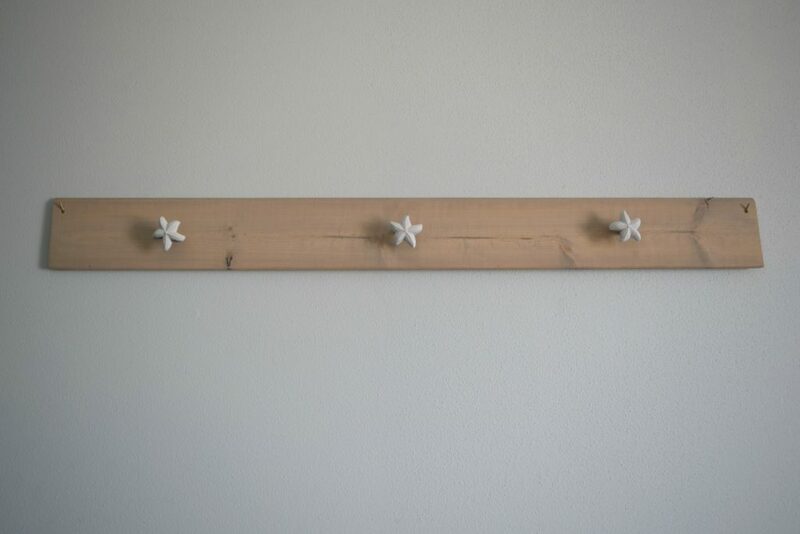 You can see more of the wood stain color with the contrast of the light walls and white star fish. I wanted a soft and beachy feel to this and think that is exactly what this is! To attach the frames to this I am using some twine. 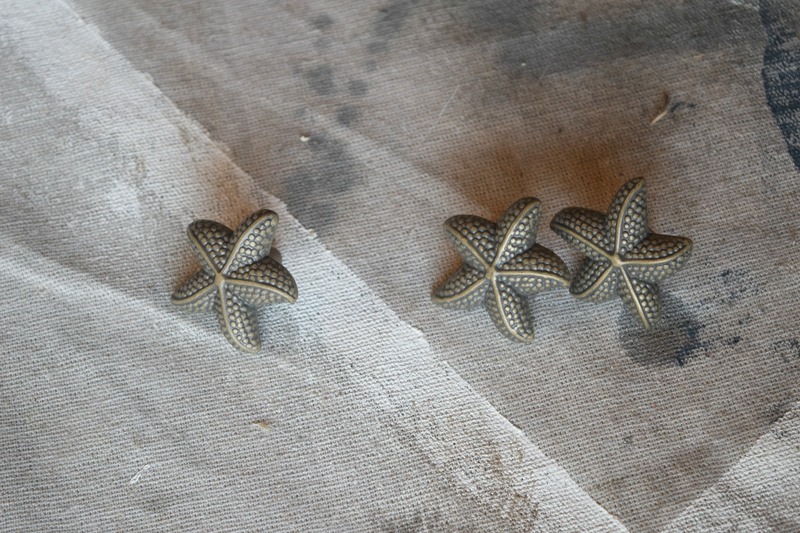 Tying the twine into the hook and then hanging it over the starfish knobs, then tying the other end. 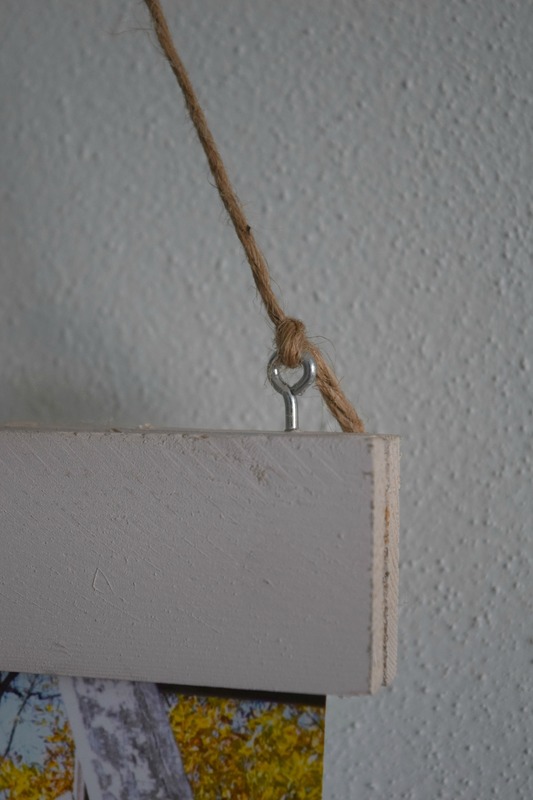 I could have gotten fancier with the knot or even the string used, but as I said; I am wanting to keep this simple and uncluttered. Success! 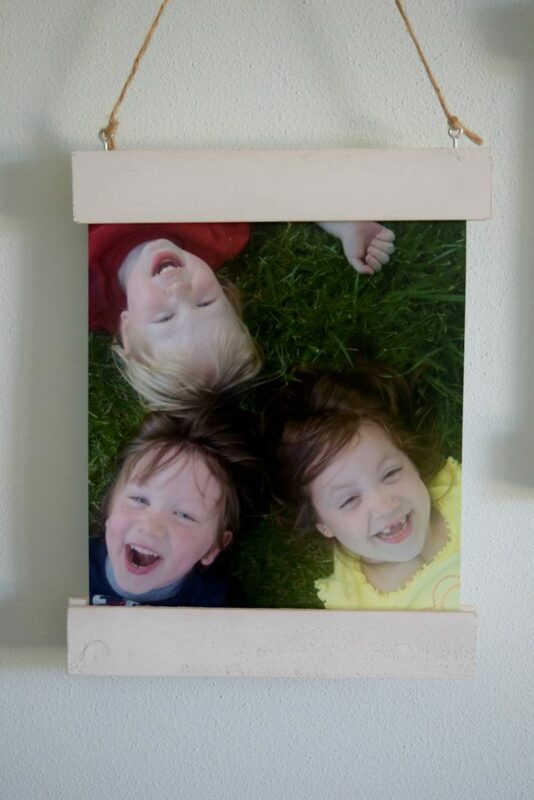 The magnets held, the board stayed put and this easy to change wall art display with magnet frame is ready for my cuties and their precious faces. 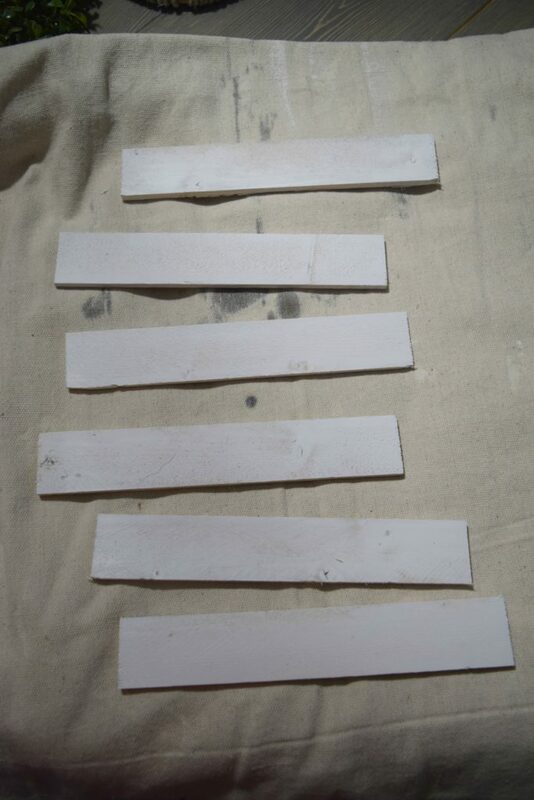 As you can see, the wood frame pieces are slightly apart because of the small magnets, but it is nothing that is too obvious. I like the contrast of the white starfish and wood frame pieces with the color of the twine. I think it makes them all pop so nicely. It has a modern coastal feel to it. My trio of littles being their adorable selves. I need to get a larger home just so I can have even more pictures of them on my wall. With the pictures being 8×10 they are big enough to make a statement but not too large. I can easily swap them out for new ones. Or I can swap it out for their art work! I had to showcase the versatility and ease of changing out the images for the kids art. My kids have all informed me that they each want one of these in their bedrooms so they can change out their art when they want to also. They were so easy to make, I don’t see that being an issue. 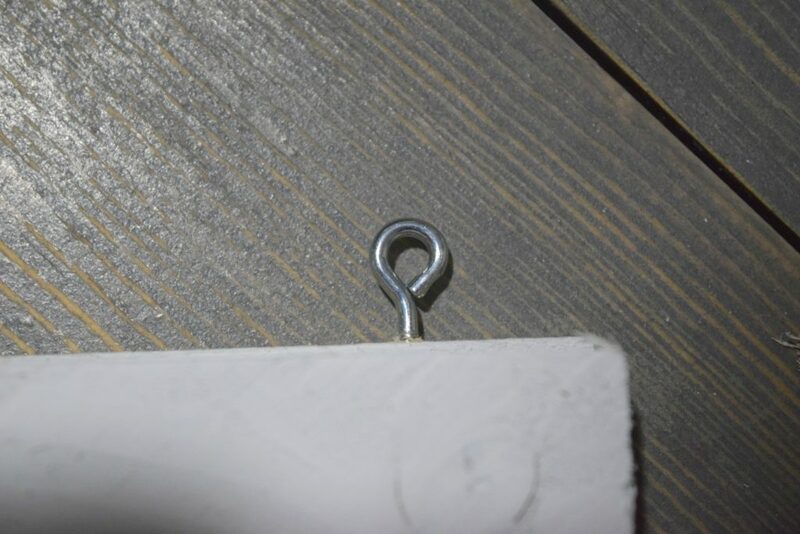 I can even have different hooks chosen according to their interests. My head is already spinning with the ideas. 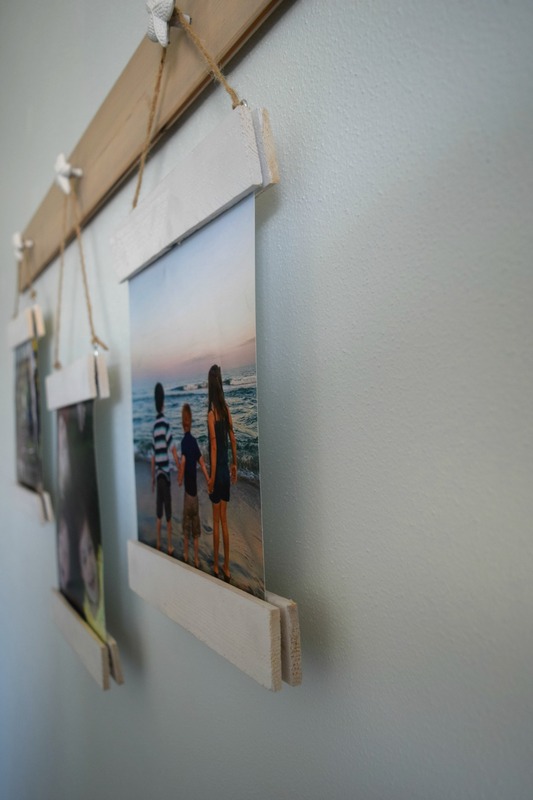 Now I just need to find the wall space in their rooms…..
Eek, I love when things come together with a project. 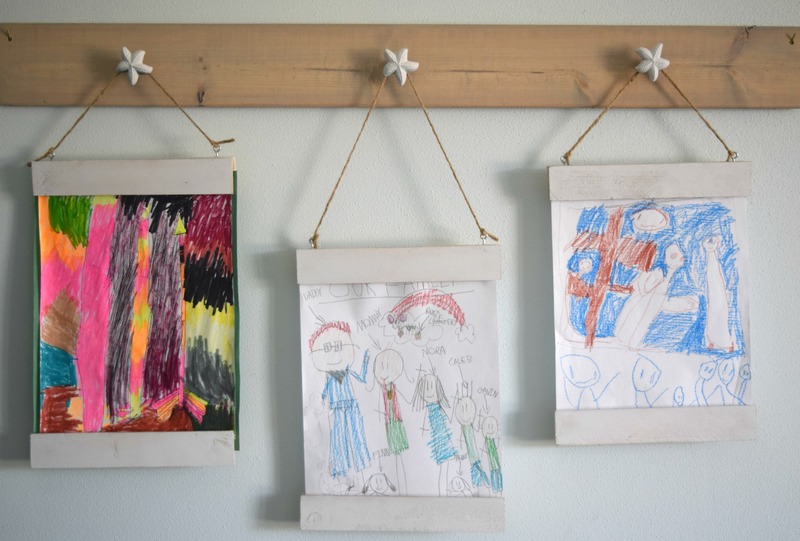 I zeroed in on the needs for more display options for pictures, something easily changeable, and lastly something that gave me options to either have pictures or my kids art displayed. This Easy to change wall art display with magnet frame is the perfect new decor item for my home! 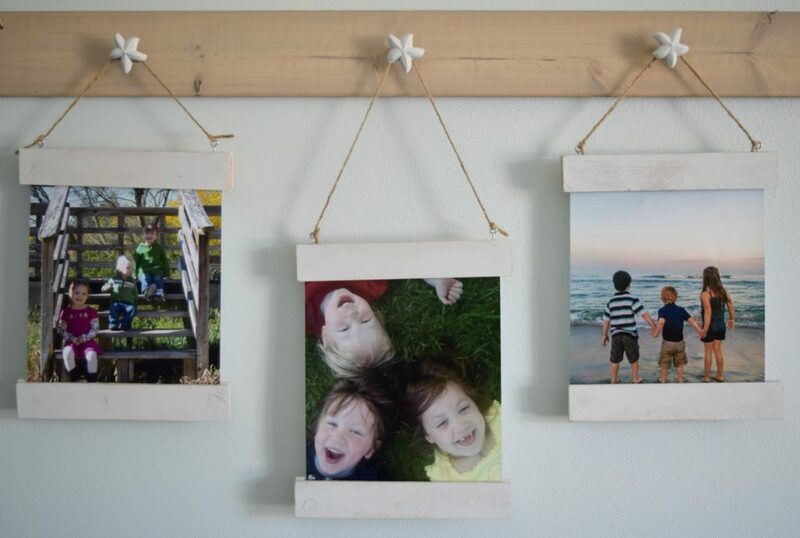 I can display my cute kids, cards, images I create, printable, or art my kids make. The hardest part to this whole process was deciding what pictures I would use for my kids, I happen to have some very photogenic children. Although, I do not think I have ever seen a bad picture of kids. They are too darn cute, adults…. you have to get the right angle sometimes…. 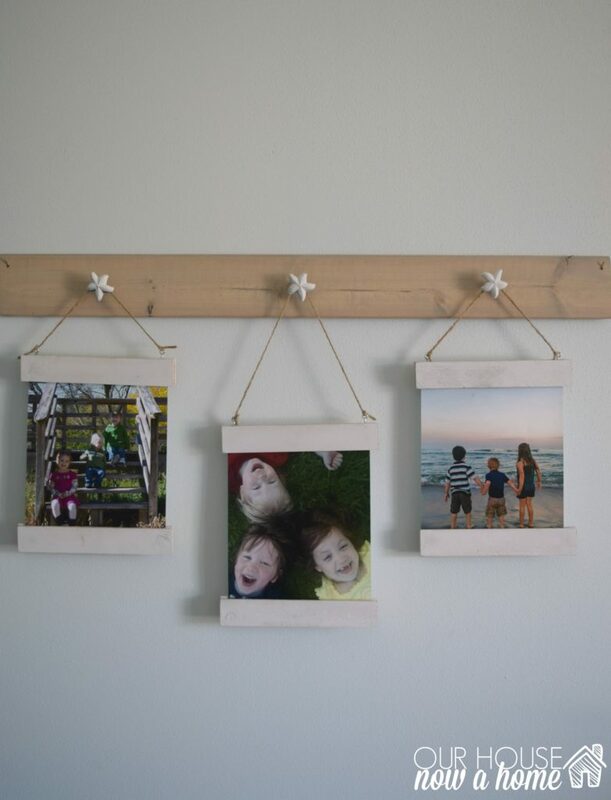 What a fun way to display your photos. I don’t have many “physical” photos (since most of my photos are saved to my computer or USBs) but I have been into taking polaroids lately and I’ve been trying to come up with a better way to display them. I can’t wait to try this. I love this so much. What a great idea, I have photos all over the place and guess what I will be doing this weekend??? Seems easy enough to make and a person could do several different sizes depending on their pictures size. I would have to paint everything because that is just me. 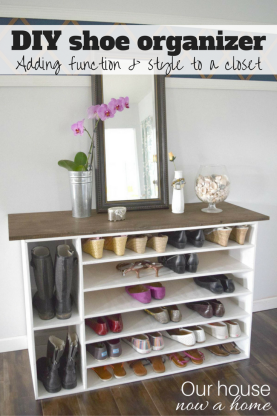 So adorable – I absolutely love this idea! I’ve been wanting to develop more pictures but not necessarily put them in a frame so I’m liking this a lot. Wall art adds beauty to a room. 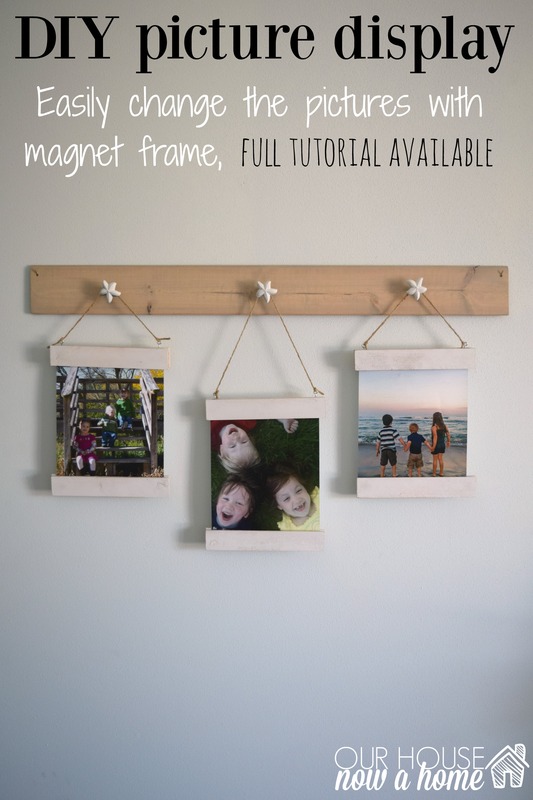 I really liked this idea of using magnet frame. These are looking cool. Love it. There are a few photographs we have from a recent trip that I was wondering what to do with. 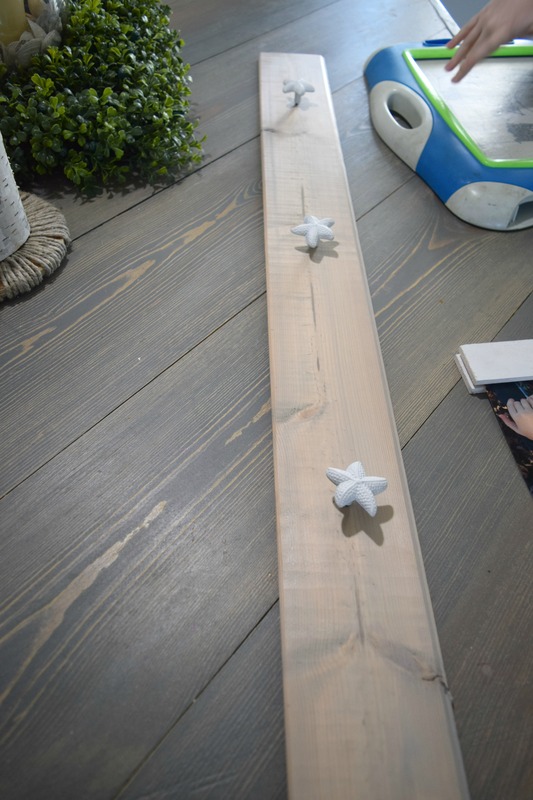 Love how easy this DIY is – realistic for a new mama to complete during naptime! I just love this idea! We always have photos that we change out, so this would be perfect for that. I need to make one! Oh my gosh, I love this so much! I have a small blank wall in our living room, above the love seat. I have yet to know what to put there. I have got to make this! I love this idea! And the fact that it has a coastal spin. 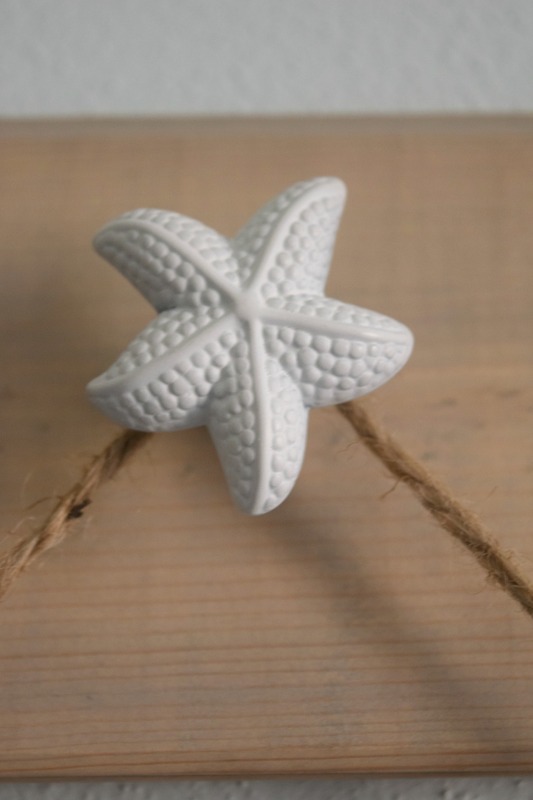 I’m all about coastal decor and I’m in love with this craft project. I’m always wanting to change up my grandkid’s artwork so this will come in handy. This is adorable! I love the idea of using it for kids artwork! I’m totally making this for the playroom! Cute DIY! 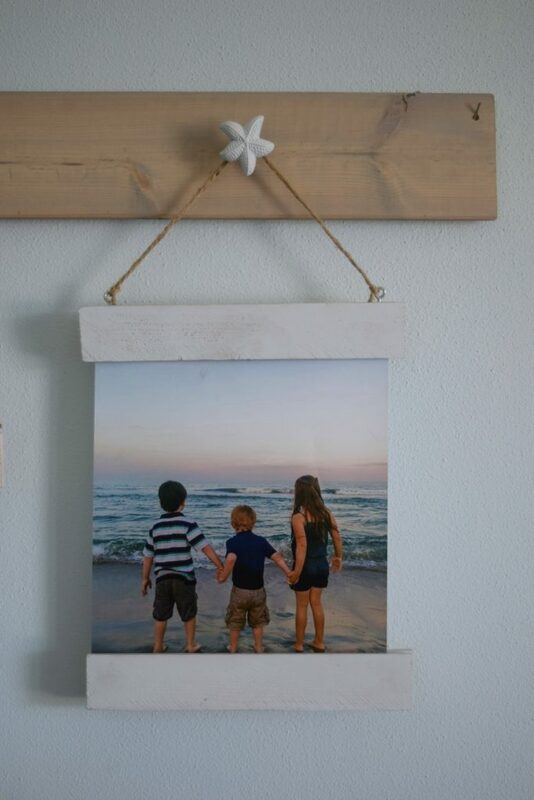 This would be perfect for displaying seasonal vacation pics without taking up mantle space. Too cute and oh so easy. What a beautiful idea. I have a condo in Florida and this is going to be perfect for decor. Thanks for sharing in such great detail. I love this idea! I take so many pictures that I like to change them out when I can. I need to get crafty! I love this! We have scrap wood in our garage and now I’m thinking instead of throwing it away, I can make a coat rack on my wall by my garage. So many ideas! I just love this frame work. Simple and beautiful. You say easy but I am totally intimidated by your DIY skills. I have zero amount of it for myself. This display is so cute! I love that you can change the picture. Thank you for the tutorial. What a beautiful way to display family photos. 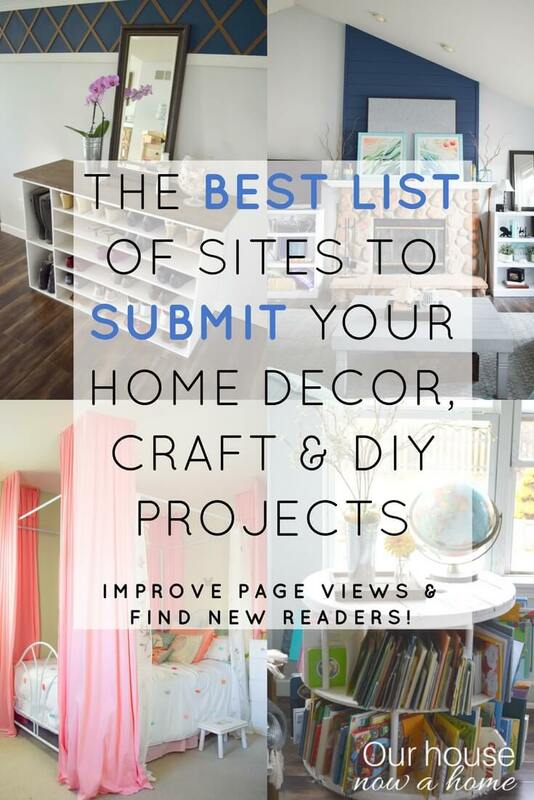 I love how unique it is and how you make it yourself–I feel like anything DIY makes the item much more special. 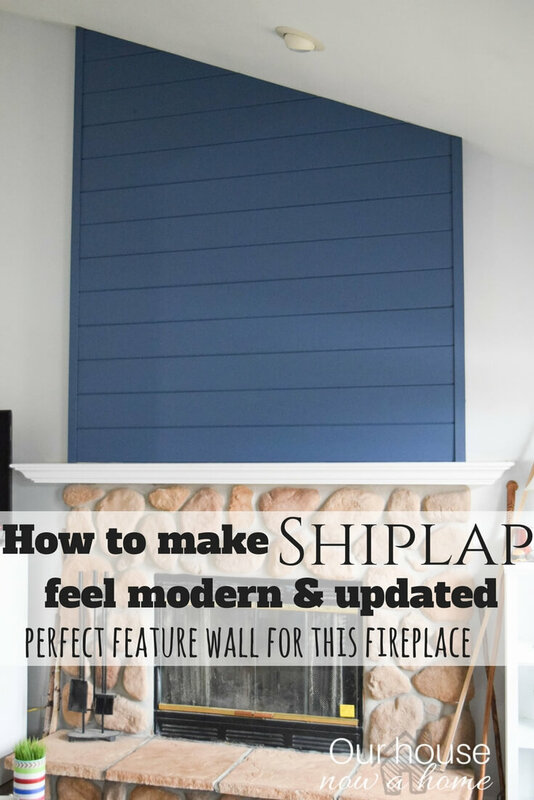 This si just darling and so easy to put together. 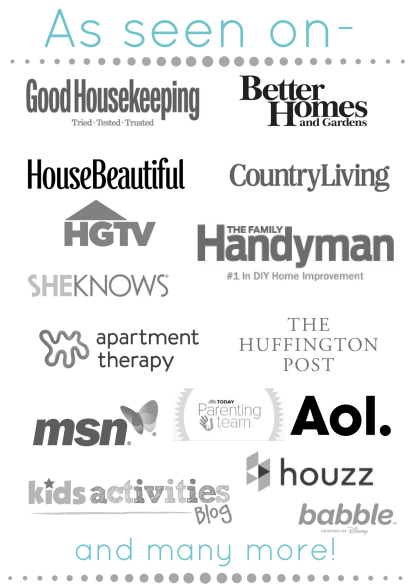 Also pretty easy to personalize depending on your taste or decor. 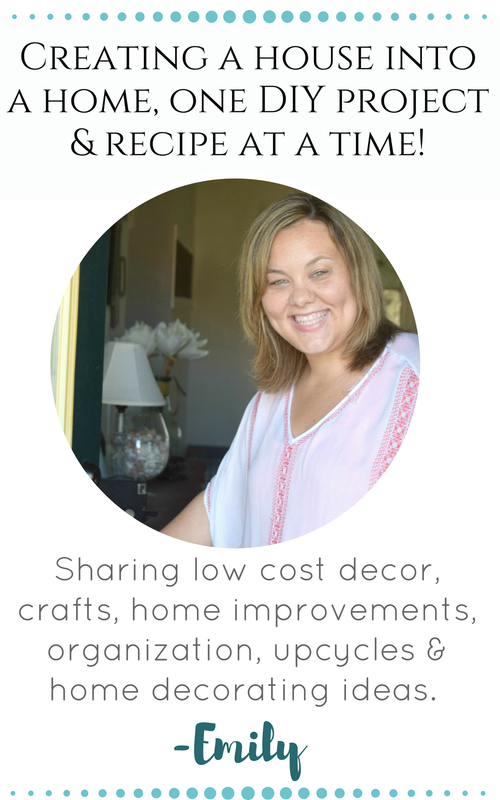 Loved this DIY thanks for inspiring us! That’s such an adorable idea! I’m always looking for fun new ways to display our family photos. I love this so much! It’s so adorable, and it turned out so great. 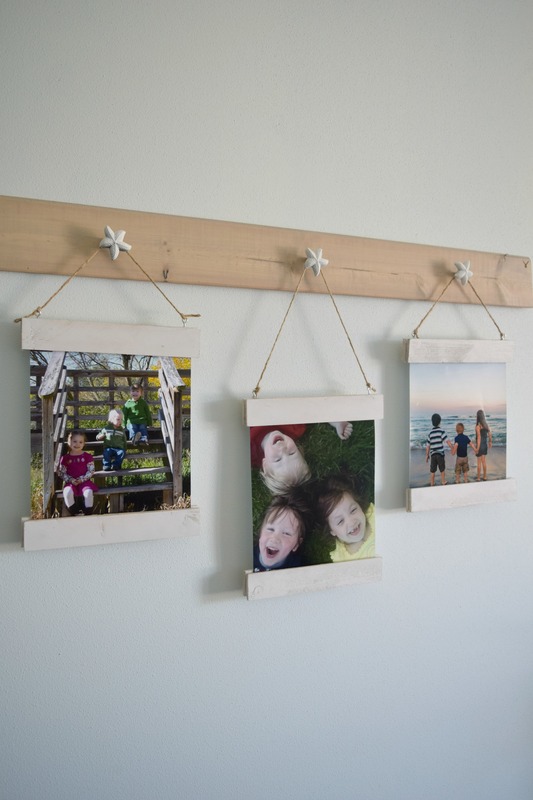 What an awesome way to display photos. 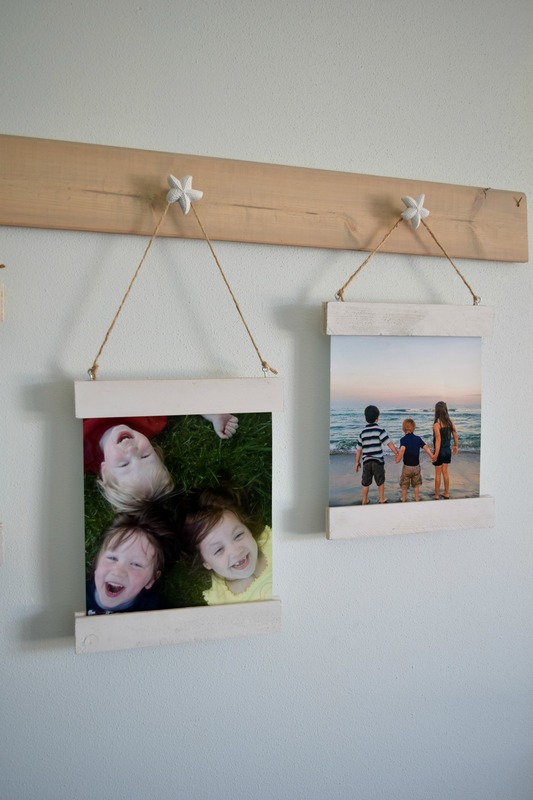 That is a really easy to make picture frame. I love that it is easy to change whatever you want displayed. The magnets were a cool idea. My kids are older so I don’t have “artwork” to display, but I sure have a lot of photos I can hang in those frames! Oh I love this project. I have just the perfect wall for it and could display photos of my new grandson on it.